← The Key to Eraserhead? 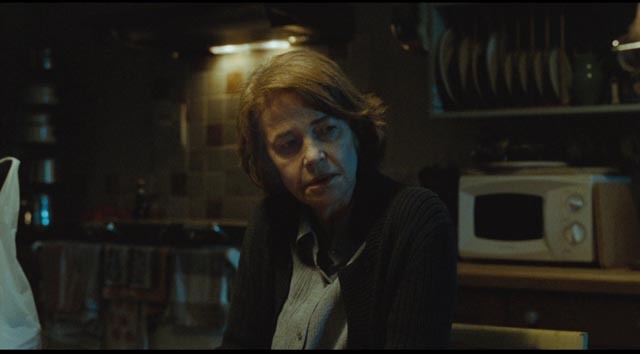 The considerable pleasures of Andrew Haigh’s 45 Years (2015) are, I suppose, what might be termed “old-fashioned”. There’s no fancy camera work, no flashy editing. Just a quiet, patient attention to character. The film has no big dramatic moments, no shouting matches, no action scenes … just two people, an elderly married couple, whose lives are up-ended by an unexpected piece of news which reaches back into the past before they ever met. The narrative, such as it is, plays out in the faces of these characters, quietly revealing massive upheavals of emotion which they are not equipped to articulate. This film belongs to that lineage of British cinema which takes as its subject repressed emotion – running at least from David Lean’s Brief Encounter (1945) to James Ivory’s The Remains of the Day (1993). But it also has links to a similar strain in Japanese cinema, in which socially unacceptable emotions are displaced and obliquely expressed through small, seemingly insignificant details of behaviour. 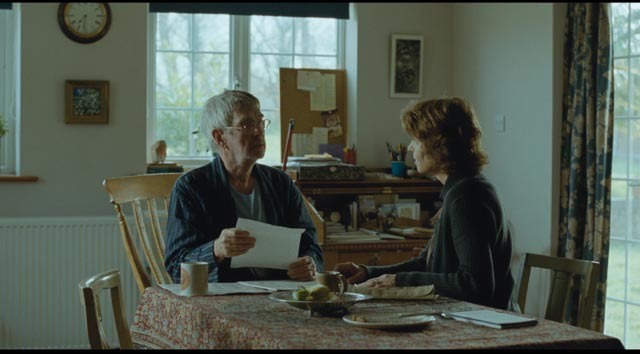 Kate Mercer (Charlotte Rampling) and her husband Geoff (Tom Courtenay), living quietly in the Norfolk countryside, are planning a large party in the nearby town to mark their 45th anniversary. Or rather, Kate is planning the party. A former teacher, she is the more active and outgoing of the pair. Geoff, a once politically committed industrial worker, is now frail and retiring, having had open-heart surgery several years ago. They have settled into a life of complacent routine – each morning, Kate takes their large dog for a walk across the neighbouring fields; Geoff sits at home reading; Kate goes shopping; they drink tea while chatting about inconsequential things. But there are little signs that their surface comfort may conceal something less than complete satisfaction. Finding Geoff with a copy of Kierkegaard when she gets back from town, Kate can’t resist a little dig about him having several copies of the book, though he has never managed to get through it. He in turn expresses little interest in the upcoming anniversary party. Their routine is disrupted in the film’s opening scene, a few days before the party, when Geoff receives a letter in German, which he at first has a little trouble deciphering. It was sent from Switzerland to inform him that the body of a woman he had been with in the mountains fifty years ago has been found frozen in the glacier into which she fell. Kate knows about the incident with Katya, but is puzzled that Geoff has been sent the letter. Over the next couple of days, new details emerge which indicate a much deeper connection between Geoff and Katya, something he has never revealed to her in the forty-five years they’ve been together. As the days pass, Geoff seems to drift more deeply into that past and all the emotions it contains for him, while the revelation of those emotions undermines Kate’s understanding of their whole history together. The more she learns, the less she seems to know Geoff. She begins to lose any sense of the authenticity of their life together. This is the film’s central theme: what happens when you realize that the life you have lived is not in fact what you thought it was? The art of 45 Years lies in the ways in which Haigh draws all of this out through the faces and (often mundane) words of Kate and Geoff. What is remarkable is that this is just the writer-director’s third feature and yet he has absolute confidence that his actors can covey everything he is trying to say without his having to add stylistic emphasis at any point. It’s rare these days to see a filmmaker so willing to remain in the background, and initially one might be tempted to think of the film as quite artless; but as it progresses it becomes apparent that it conceals an impressive degree of craft beneath that deceptively simple surface. Haigh has an enormous degree of respect for his actors, and his patience is rewarded by some of the finest work of Rampling’s and Courtenay’s careers. It’s easy to forget in the busy-ness of so many movies today that the craft of acting is rooted in a mysterious alchemy; we may recognize the actor, be familiar with their work, and yet what we see on the screen is the character. This transformation is wrought by a combination of technique and something less graspable, for want of a more expressive word “art”. Between them, Rampling and Courtenay bring more than a hundred years of experience to this project and they seem to live these characters effortlessly, an achievement even more remarkable given that so little actually happens in the narrative; everything is interior. There are moments when the camera simply observes Rampling’s face and we can see the thoughts and feelings churning inside her as she struggles to understand them herself; we watch her sense of herself, of her life, crumbling … and yet her features remain quite still. That she can express so much in that stillness, and that the camera can see it all, is remarkable. 45 Years reminds us that so much great cinema is, at its root, an exploration of what it is to be human. But the centrality of the actors does not diminish the work of Haigh, his cinematographer Lol Crawley and editor Jonathan Alberts. The visual sensitivity to both landscape and human faces, shot by Crawley on 35mm film with mostly natural light, gives the film a tactile sense of place, while the editing evokes the rhythms of lives long settled into routine and now disrupted by the intrusion of an unshared past. As Haigh and producer Tristan Goligher suggest in the disk’s supplements, 45 Years is in a way a ghost story; an unsettled past impinges on the present and causes unwanted change. 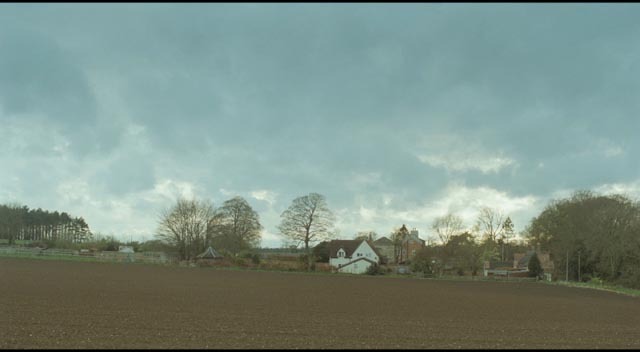 The chilly and damp Norfolk landscape seeps through the film and even as Geoff works through his emotions and finds his way back, Kate has been exposed to something from which she may never fully recover. Criterion’s Blu-ray features a 2K transfer from the original camera negative, effectively rendering the desaturated colour scheme and the detail in scenes shot with very low light. The soundtrack is as quiet and subtle as the film’s mood; there is no score, just voices, natural sounds and an evocative use of diegetic songs which reflect the character’s moods. There is a relaxed, conversational commentary track from Haigh and Goligher which covers both the practical problems of shooting on a limited budget and the creative experience of working with actors of such stature. A making of featurette (36:42) covers similar ground, but includes the voices of cinematographer Crawley, editor Alberts, and the two stars. There is also an interview with writer David Constantine (13:14) in which he talks about his original short story and his (positive) response to Haigh’s adaptation. Finally, there is a trailer (2:07) and a booklet essay by critic Ella Taylor. This entry was posted in Review and tagged Actors, Adaptation, Blu-Ray, British Film, Criterion, Directors. Bookmark the permalink.